Performers include: Jared Padalecki, Jensen Ackles, Jim Beaver, Jeffrey Dean Morgan, Misha Collins, Genevieve Cortese, Katie Cassidy, and Lauren Cohen. Brothers Dean and Sam Winchester (Jensen Ackles and Jared Padalecki) lost their mother at a young age at the hands of an evil supernatural demon. As a result, the boys’ father, John (Jeffrey Dean Morgan), devoted his life to destroying demons, avenging his wife’s death and training his sons to do the same. While John and Dean continue to focus on all things paranormal, Sam eventually goes to college to study law and to have a normal life with his girlfriend, Jessica Moore (Adrianne Palicki). When Dean tracks down Sam to tell him that their father has disappeared and that he needs his help to find him, Sam is hesitant to begin such a mission. But, when his girlfriend dies in the same manner as his mother, Sam joins his brother and together, they travel around the country searching for their father and saving the innocent from powerful supernatural forces. But the evil spirits they encounter aren’t going down without a fight and Dean and Sam must rely on everything that their father has taught them. When the brothers do finally find their father, he’s just encountered the demon who took the life of their mother. The three of them battle the demon and he escapes, but not before letting Sam know he has ideas for him and “all the children like him.” Vengeance for their mother’s death has only just begun and the Winchesters take their 1967 Chevy Impala on the road yet again to try to find the demon and uncover the mystery of Sam’s destiny. Supernatural: Padalecki and Ackles Committed to Season Six, Will It Be Worth Watching? Supernatural is the best show ever, please don’t ever cancel it, I have every series out and never miss it, I watch it everyday, love this show, Sam , Dean and cass are the best, do not take out cass please. Supernatural is better than in has ben for years.Let the show keeep going 😀 I love it..it means everything to me. I am from den denmark, and have grown up watcted these shows. And it is my favorite series. I feel like Supernatural is tired now. At this point I would be satisfied with a happy ending. Thrilled that Supernatural has been renewed for it’s 14th seasons! i love this show please renew it their is so much more that can be done with this and bring back so many people with the other world that has been open. This is one show that can continue for many more seasons! I was sad to see Crowley died but hopefully they will bring him back. 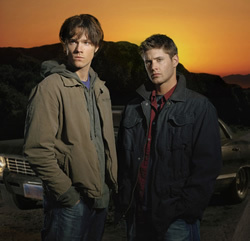 I love all the characters and the Winchester boys aren’t bad to look at either! Love this show! I love Crowley but when he sort of became friends with sam and dean they had to get another bad guy great actor. Rumor is Cass will be back but they burned the body he could be a ghost but doesnt burning stop ghosts unless its attached with an object. I love the show and all the cast. I’ve just finished watching the first 11 seasons and am desperate to see season 12. I know they will add it to Netflix sooner or later, but, I need my fix now. Can anyone offer suggestions?